I have to admit, these Demolition films are pretty fun for what they are. 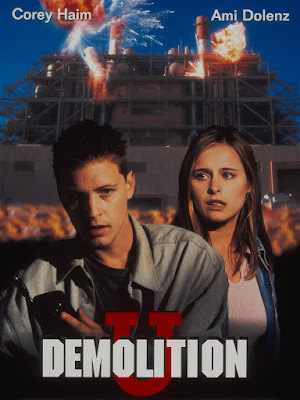 While I really didn't know what to expect with the first one, Demolition High, I found it to be an entertaining "leave your brain at the door" type of film that's easily a Die Hard ripoff with Corey Haim as a new transfer student at a high school when a group of terrorists take the school hostage. Naturally Haim implores his New York upbringing to outsmart them and take them down one by one. Directed by legendary low-budget king Jim Wynorski, it was ultimately better than I expected, with a killer cast (Jeff Kober is the villain!) and a fun vibe. Sure it's silly, but it's surprisingly competent and a fun easy way to spend your hour and a half. Released a year after Demolition High, Jim Wynorski's friend (and fellow low-budget king himself) Kevin S. Tenney (Witchboard, Night of the Demons) takes on the sequel, this time taking place partly in a college, as our hero is once again put in a situation where he must take down a band of terrorists during a school field trip. While not as entertaining, engaging or as well made (more on that later), it's still worth a watch. At a brisk 90 minutes, there are worse ways to spend an hour and a half of your life. It seems that director Tenney, once revered within the horror community in the 80's for his horror classics, and even delivering a kickass action flick in 1990 with the criminally forgotten Peacemaker, just doesn't have the touch anymore. While the film looks "okay" for the most part, it's in the action scenes where the film really starts to fall apart. Nothing flows smoothly, with the editing, choreography and camera setups looking downright amateurish, which blows my mind considering how much I love Peacemaker, which is full of nonstop action and insane stuntwork. I don't know what happened here, but none of this looks or feels like the same Kevin S. Tenney who made a handful of classics before this. Still, it's not a terrible way to spend your time. You get Haim (also a producer on this) looking healthy and charming, Amy Dolenz being impossibly cute, and so many cliche's that you can't help but enjoy the ride. It's so silly (more so than Demolition High), and shockingly amateurish that it almost ends up being a parody. While not as good as the first one, it's not terrible. Well yea, it's terrible, but at least it's terrible in a semi-fun way. 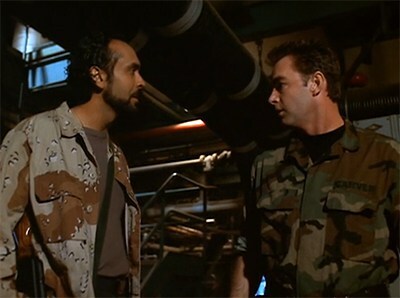 Robert Forster is a welcome addition to this mess as a no-nonsense general, as is original SNL cast member Laraine Newman and Khrystyne Haje from the classic 80's sitcom Head of the Class. So if anything, the cast keeps it engaging enough. It's a shame this didn't turn into a series of more films, because it has potential and I quite enjoyed the first one. I don't know where it could have gone after college, but in the end, it's a fun, silly series of films that never take themselves seriously, and if anything, it's always good to see Corey Haim in top form taking down terrorists left and right. You can currently watch both Demolition High and Demolition University on Amazon Prime for FREE.